Melissa Hege, AICP of South Florida-based Melissa Hege City Planning LLC. 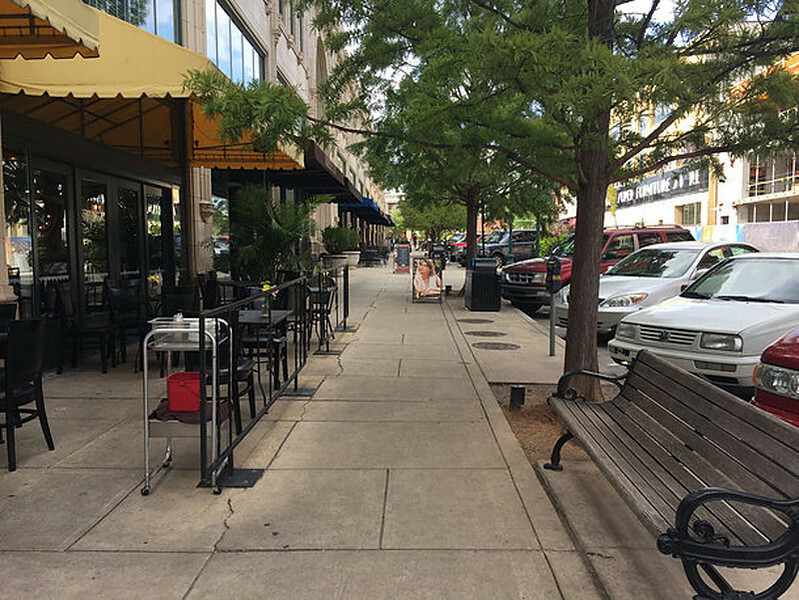 takes a trip to Asheville, NC and shares what she learned about implementing smart and subtle, yet affordable urban design solutions. This month the Zika virus in Miami sent me packing to North Carolina. This expectant mama wanted to take no chances at the height of mosquito breeding season and so, with my abrupt relocation, I found inspiration in a town called Asheville. Asheville was settled on a plateau within the Great Smoky Mountains, the Blue Ridge Mountains and the Appalachian Mountains in 1797. Just ask my kids who barely survived the car drive on the windy mountain roads through Hickory Nut Gap across the Eastern Continental Divide. Altitude 2880 feet. I’m not making this up. But it was worth it if not for the edgy and adorable hipster town filled with tattoo parlors, bars, knitting stores and wine/bookstore, then for its killer food. Tomatoes, biscuits, barbecue and the holy grail- bacon. Rest assured, this in not another food blog, but it’s worth mentioning as it shapes the culture and character of this town. 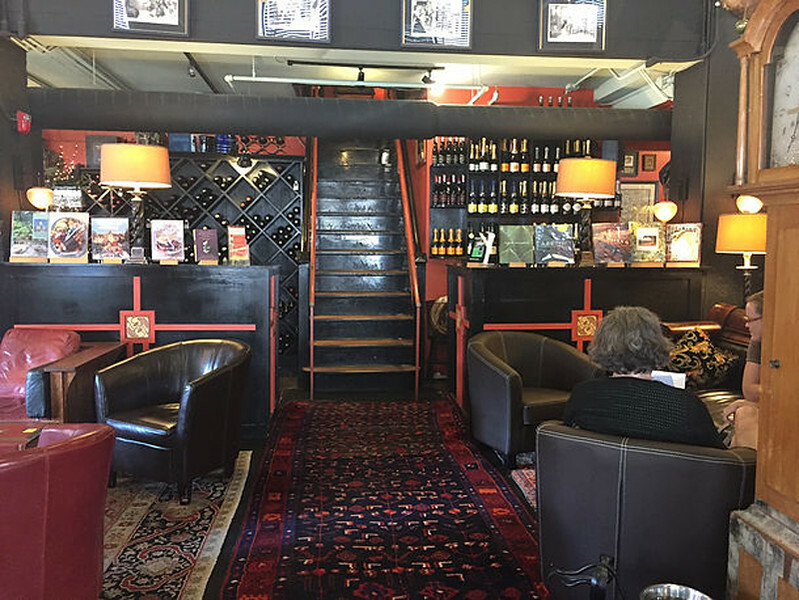 Behold, the bookstore/wine bar complete with comfy chairs, rich decor and a low key vibe. This is the new generation of Starbucks people! Second hand books and delicious wine for those who need some me time. 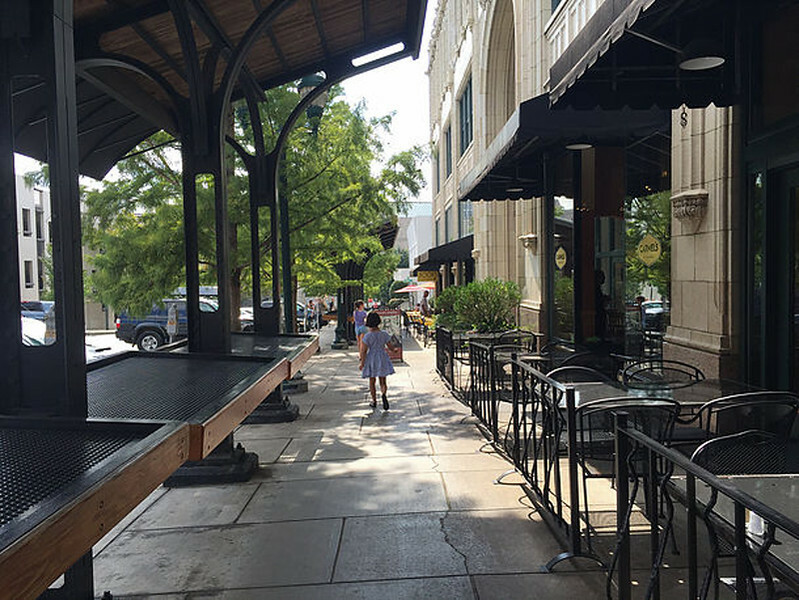 Just outside the bar is a sidewalk design which is more typical of Europe, then the States. 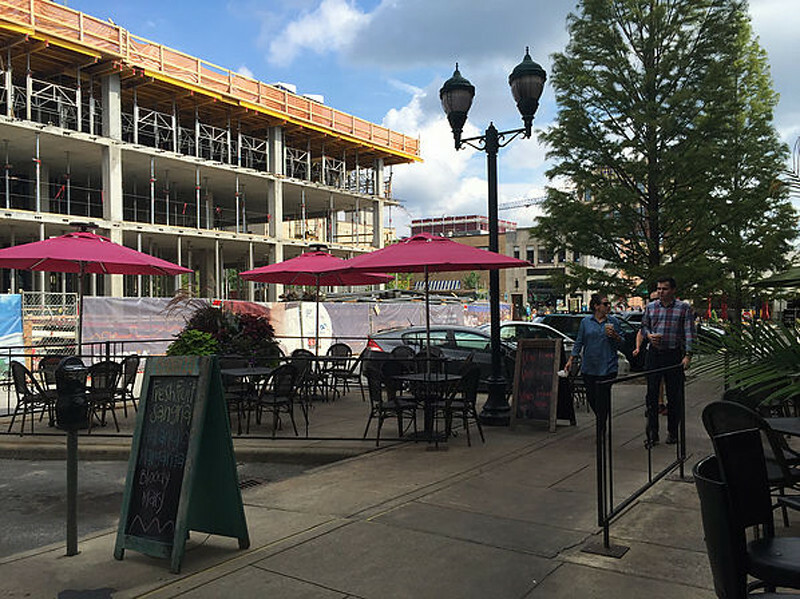 Mixed in with the angled parking are some luxuriously wide “bulb-outs” with cafe seating for the adjacent restaurant. Think Miami Beach’s Lincoln Road meets Coral Gables’ Miracle Mile. They even added streamlined metal railings to create an additional barrier to protect the seating area. Genius. And here’s another view of that same sidewalk with some key design features: a furniture zone for benches and trees, a pedestrian zone with a different paving design and a cafe zone with another sensible railing to separate the people watchers from the people being watched! Add a pair of sunnies and you’re set. I couldn’t resist this early example of the shopping mall. We have several of these relics in downtown Miami, though they have not been restored and many have been completely covered up. But Asheville got it right. They popped in a glass ceiling to let in lots of gorgeous light, added plants and greenery on multiple levels, decorative lights and an impeccable restoration which any historian would approve! 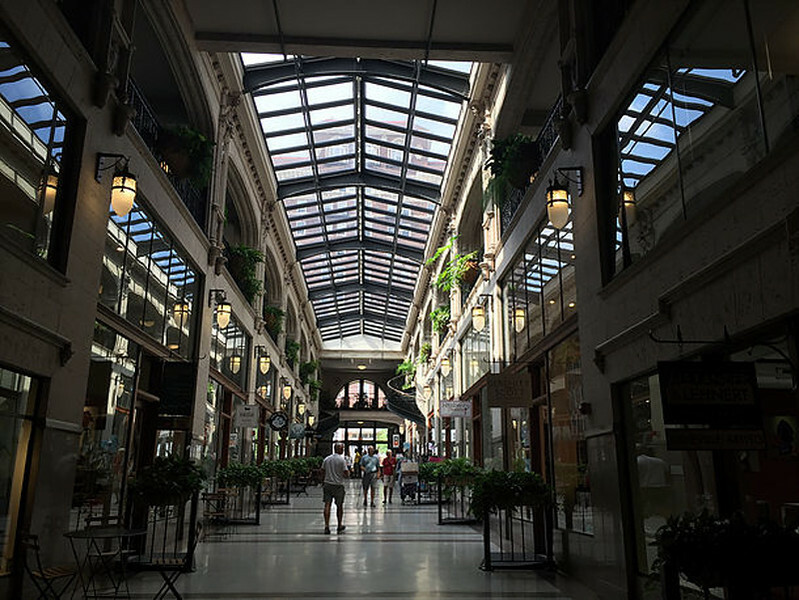 The Grove Arcade opened in 1929 and was closed during World War II and finally reopened in 2002. And it was definitely worth the wait! Inside is a charming mix of cafes, jewelers, housewares and clothing and a talented juggling grocer who delighted my children. My husband gets credit for finding this gem.